This summer the Scottish campaign, Good Life, Good Death, Good Grief, which works to make Scotland a place where there is more openness about death, dying and bereavement, has partnered with the world renowened Edinburgh Fringe Festival to launch its own programe of shows – Death on the Fringe. What better place to encourage debate on a difficult issue we all face, than the huge arts festival on our doorstep? The Edinburgh Festival Fringe is the largest arts festival in the world. In sheer numbers alone it is impressive – over two million tickets for nearly 50,000 performances of over 3,000 shows in 299 venues – but in cultural impact it is perhaps even more significant. Throughout its 67 years of existence, it has become a home to cutting edge and thought provoking arts events, which challenge existing ideas and tackle taboo subjects not often dealt with elsewhere. Death on the Fringe is a hand-picked series of Fringe shows that look at death and dying from different perspectives – some serious, some comical – but all contributing to the debate on death and end of life matters. Each of the performers and groups have their own unique take on the subject, as indeed we all do. The ambition of the project is to encourage Fringe audiences not to steer clear of this tricky subject matter and to point them towards some brilliant, entertaining and important events. The project has generated media coverage as far afield as the US edition of the Huffington Post, and this helps to promote the shows and also to raise awareness of Good Life, Good Death, Good Grief and its agenda. We launched Death on the Fringe on 1 August with a special event in the historic anatomy lecture theatre at the University of Edinburgh Medical School. Instead of the dissections and medical procedures with which generations of medical students have been ‘entertained’, guests were treated to a selection of Death on the Fringe performers giving previews of their shows. There were snippets from Alba: The Musical, the tale of one young man’s journey to scatter his father’s ashes, ahead of its world premiere at this year’s Fringe on 11 August. There were comic turns from Nathan Cassidy, who uses his show to reflect on his own Date of Death and Robyn Perkins who explores the lighter aspects of the sudden death of her partner in Over It. 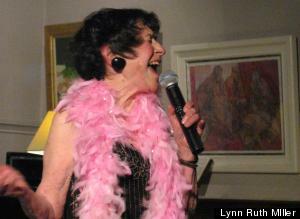 Guests were also entertained with the stories of 80 year old Lynn Ruth Miller (as seen on Britain’s Got Talent) whose stand-up show announces she’s Not Dead Yet! We are also delighted to have found a children’s show to be part of Death on the Fringe. New Zealand’s Little Dog Barking have brought their powerful adaptation of the German children’s novel Duck, Death and the Tulip to the Fringe. 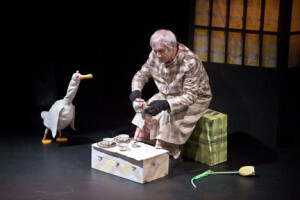 Explaining death to younger audiences with puppetry and magic, it has been winning plaudits from all sorts of places. Amongst the plays we’ve included are Chris Is Dead, the moving tale of three flatmates dealing with the death of a fourth, which has just finished its one week run to rave reviews. Two further plays join us this week – The Three Peaks and Dead Fresh – a serious play and a comic play, showing just how many ways there are of dealing with this difficult topic. Death on the Fringe runs right through until the 30 August, and we’d encourage anyone coming to Edinburgh this month to try a show or two. At the very least you’ll be entertained, and you may just leave a show resolved to live your life differently and to talk to your loved ones about death before it is too late. You can get a full list of shows on our website or keep up to date with us by following @DeathOnFringe on Twitter.